It's a Boy for Jon and Tracey Stewart! Last month my husband and I welcomed a very special delivery from Farm Sanctuary. We were honored by having two awesome rescue sheep named after us!! Jon and Tracey were rescued from a neglected home in Upstate New York along with their friend, Louise. 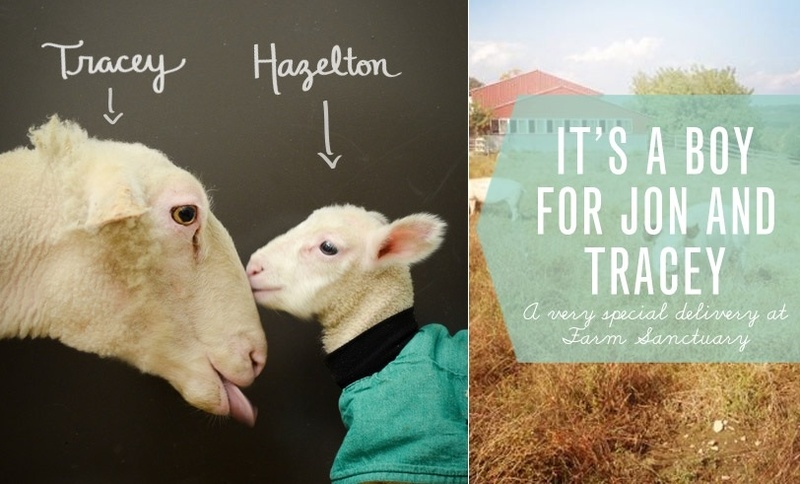 And as if being part of Farm Sanctuary's family wasn't gift enough, Tracey had a little lamb! The year of the sheep began on Feb. 19, but we were celebrating two days early at the New York Shelter when new lamb Hazelton finally began nursing. We had been anxious for the little guy and his mother, Tracey, ever since Tracey went into labor with him four days before. As overjoyed as we were to welcome Hazelton, we were also anxious for him. His heartbeat was racing, his respiration was high, and he was unable to nurse. Further complicating matters was bone-chilling weather. Mama Tracey braved subzero temperatures and wind chill during what has been one of New York State's worst recent winter. And Hazelton -- without much muscle or fat to keep him warm -- would endure the same. He was suited up in not one, but two coats to keep him warm and protected. For four days, staff kept constant watch over him, putting in long hours and rearranging schedules to make sure he had the help he needed. Caregivers performed regular diagnostics and tube-fed him every six hours -- a delicate procedure demanding expertise and great care. The whole shelter pulled together to help this lamb, and when, on day four, he finally began to nurse, we breathed a collective sigh of relief. Our little friend isn't out of the woods yet, but this development is a very good sign.